Lee Kuan Yew’s strong central rule that yielded spectacular results in Singapore shows why Russia has got it right and India has got it horribly wrong. The West treats democracy as religion – a form of government so sacred that it will bomb countries into the stone age in order to sow the seeds of democracy in those places. But in Lee’s view, “Democratic procedures have no intrinsic value. What matters is good government.” The Singapore strongman believed the government’s primary duty is to create a “stable and orderly society” where “people are well cared for, their food, housing, employment, health”. Nation building: no easy task. Lee walked his talk. Under him, Singapore became a de facto one-party state. He disallowed dissent, curbed free speech, introduced corporal punishment, and even banned chewing gum. Was he a tyrant? Benevolent dictator would be a better description. Indeed, Singaporeans loved him for raising their living standards and, more importantly, their prestige. Lee served in office from 1959 to 1990, during which time he led his country through a period of remarkable economic growth and diversification. 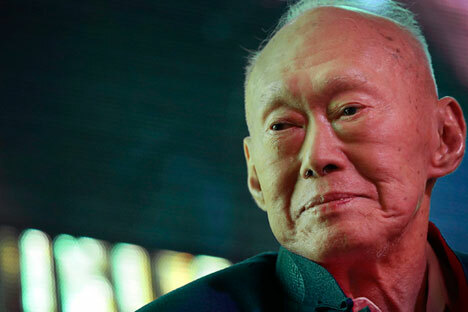 When he took over as Prime Minister, Singapore’s annual per capital income was $400; today it is estimated at $56,000. In Lee's view, there are limitations in India's constitutional system and the political system that prevent it from going at high speed. “Whatever the political leadership may want to do, it must go through a very complex system at the centre, and then even a more complex system in the various states….Indians will go at a tempo which is decided by their constitution, by their ethnic mix, by their voting patterns, and the resulting coalition governments, which makes for very difficult decision-making. If Singapore had taken the democratic route, would it have been as chaotic as India? Would it have been less prosperous? For the answers let’s turn to Russia and how it experimented with unbridled democracy and then later with strong central rule under President Vladimir Putin. When democracy arrived in Russia after the collapse of communism in 1991, it was pretty much free for all. The country was under the grip of criminal syndicates, oligarchs and sundry opportunists. The economy, remote controlled by the IMF, was in free fall, without the bottom in sight. And yet in the western view, "God was in his heaven and everything was right with the world.” The suffering of the Russian people didn't matter to them. Rather, the pictures of once proud pensioners now reduced to trading their World War II medals for a loaf of bread were gleefully published by TIME, Newsweek, and The Economist. Had Moscow continued on that path, the country would have been destroyed. The heart of Russia's industry would have been ripped apart; its navy would have rusted in ports; its mighty rocket forces would have degraded in silos. But in stepped Putin. His entry was dramatic – the Russian stock market jumped 17 per cent the day he got the job in 1999. During Putin’s first stint in power (from 1999-2008), the Russian economy recorded an average growth of 7 per cent annually. During this period, industry grew 75 per cent, while real incomes more than doubled. The monthly salary of the man in the street went from $80 to almost $600. The IMF, which worked overtime to destroy Russia’s state owned corporations and banks, admits that from 2000 to 2006, the Russian middle class grew from 8 million to 55 million. The number of families living below the poverty line decreased from 30 per cent in 2000 to 14 per cent in 2008. How did Putin achieve that? First up, he rejected the notion that western democracy and values are universal. This is precisely what Lee had done in Singapore. As the Singapore Prime Minister was fond of saying, “I do not believe you can impose on other countries standards which are alien and totally disconnected with their past.” In his view, “to ask China to become a democracy, when in its 5,000 years of recorded history it never counted heads” was completely and utterly arrogant. In western democracy the party or candidate that gets the most votes is the winner. Such a system may seem fair but in reality can create terrible outcomes. For instance, a large number of candidates can divide votes so that a totally unpopular candidate can squirm his way to power. This has happened most starkly in India where the Congress party ruled India for over six decades despite not getting the majority of the votes. In the US, western democracy could not prevent the theft of the 2000 Presidential elections where Al Gore got more votes than George W. Bush and still lost, leading to the 2003 Iraq War. Putin has rejected such forms of kleptocracy – rule by thieves – the West has been exporting. “We certainly would not want to have the same kind of democracy as they have in Iraq, I will tell you quite honestly,” he said in St Petersburg, in 2006. Both Putin and Lee have similar views on how much democracy is enough, and how much is the tipping point where democracy delivers chaos. Like Lee, Putin is unapologetic about his actions. In a speech at the Kremlin, Putin said Russia would follow its own view on democracy and shrug off any "standards enforced on us from outside". In contrast to Putin and Lee’s strong sense of nationalism, India’s first Prime Minister Jawaharlal Nehru was completely delusional. Instead of rebuilding industry and raising living standards, Nehru spent his time and energy on the chimera of world peace. He is nowadays known as the “breaker of modern India”. Unlike Lee, Nehru lapped up what his former colonial patrons dished out to him. He imposed western democracy on a poor and divided country, causing chaos that slowed economic growth and caused numerous caste and religious conflicts. A leader who protects his country’s interests is not necessarily a tyrant. Gen Augusto Pinochet, a western stooge who killed thousands of Chileans, was a tyrant. Lee and Putin, on the other hand are nation builders. Indeed, because of the dramatic economic growth of Russia, Chinese, Singapore and other South East Asian economies, authoritarian prosperity rather than democracy is now a viable governing option for developing countries. It is yet another example of the rejection of western ideas by the emerging world. On that, Lee and Putin are on the same page.